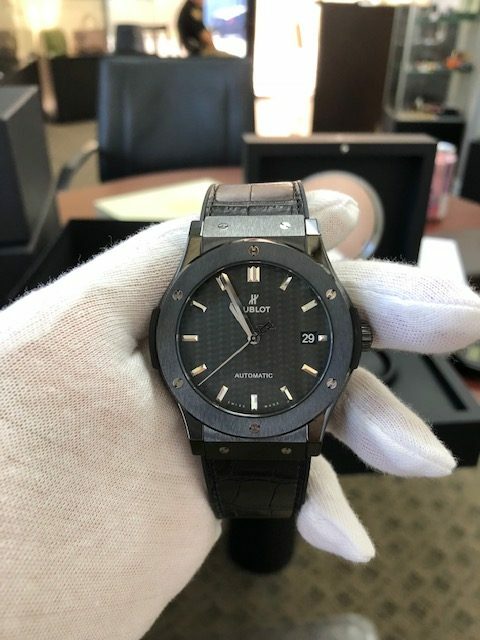 When we think of luxury watches, the name Hublot may not be one that is mentioned as often as some of the other more well known brands; but that doesn’t mean that the brand is any less when considering the manufacturing integrity, materials used and overall appearance of their pieces. 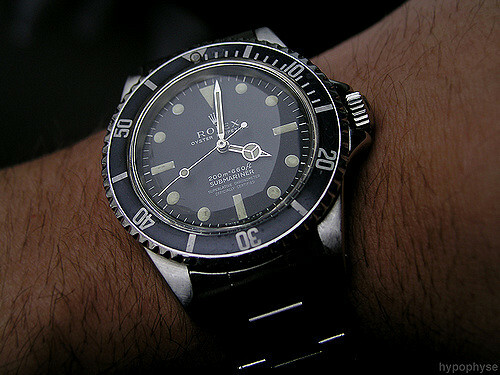 In fact, far from that, the watch is exceptional due to its style and craftsmanship. Hublot is a Swiss luxury watchmaker. 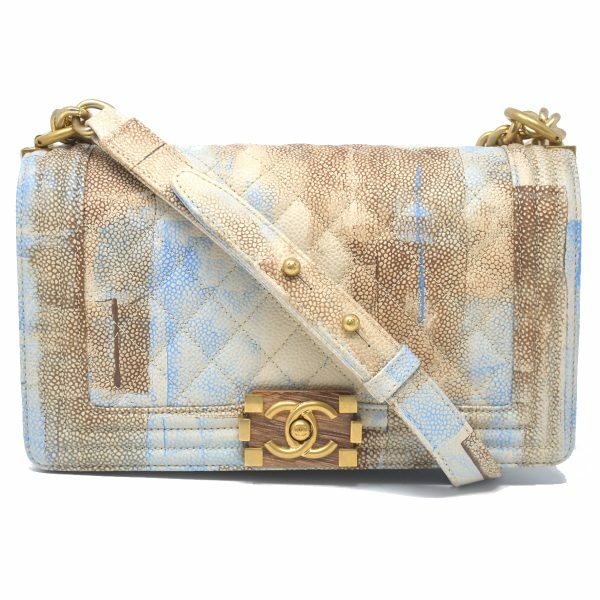 The company was founded in 1980 by Carlo Crocco who is of Italian heritage. Crocco had been working for the Binda Group, a dynasty best known for making Breil watches. He left the company in 1976 to design the Hublot watch, named after the French word for ‘porthole’. The first watch Crocco created was the first in the world to feature a natural rubber strap. The watch, and its strap, would go on to become a commercial success. Although Hublot was founded in the early 80’s the company really rose to popularity when they introduced their Big Bang line. Bulky and modern, these oversized watches took the world by storm. Following the success of the Big Bangs, Hublot wanted to bring a more classic look to the masses. The company worked with the Big Bang model, which was anything but classic, and gave it a thinner profile and simplified the dial. The classic porthole design and strong hands and hour markers of the Big Bang watches remained unchanged. The Fusion watches are so named due to the various materials used in their manufacturing. The case is ceramic with a black resin inset and the screws are made of polished titanium. All this is complemented by the weight of the Tungsten and the rubber strap. Classic Fusions are available in 42mm and 44 mm sizes and are quite comfortable and easy to adjust. These features are part of what makes the watches the timeless classic they are today. 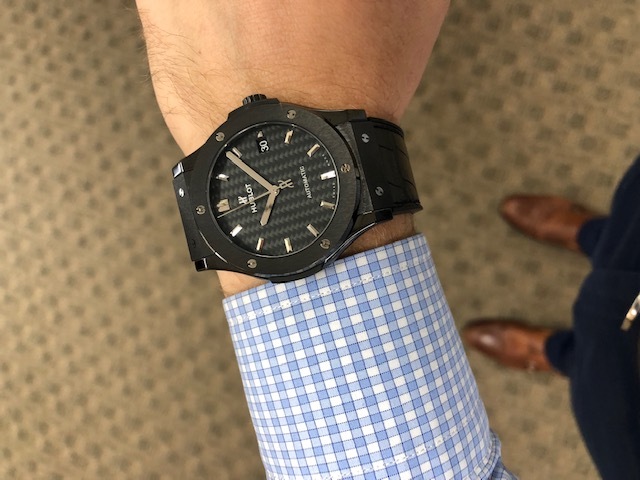 Although the Hublot Classic Fusions come in a variety of colors and styles, the all black is a stand out. 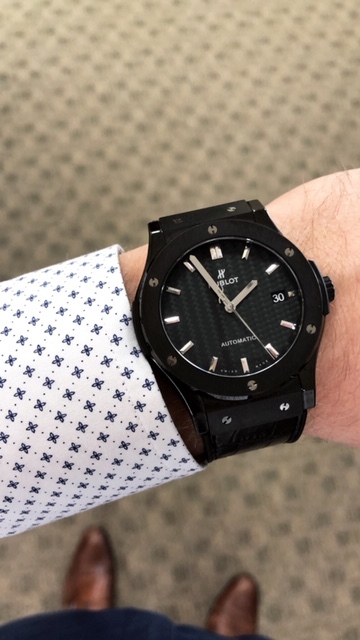 Hublot first introduced the all black model in his Big Bang line. 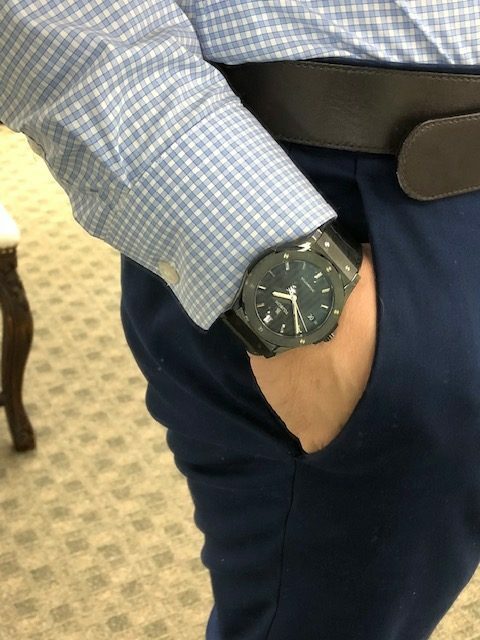 It was the first all black watch to come out in luxury watches and quickly became a fashion statement among those seeking something a bit different in a high end time piece. When applied to the Classic Fusion model, the all black feature gives it something more than just the look of a black watch. It offers a concept of ‘invisible visibility’. It boasts details that merge together to form a coherent whole. Although different Classic Fusion All Blacks will have features that vary slightly, here is what you can expect from the Black Magic, one of the more basic models they have available. Case: The watch features a fairly big case size of 45mm. It is made of a polished and satin finished black ceramic. Bezel: The bezel is vertical satin finished black ceramic with 6 H-shaped titanium screws. Crystal: The watch has a sapphire crystal with anti-reflective treatment. Dial: There is a matt carbon fiber dial with satin finished rhodium plated appliques and polished rhodium plated hands. Strap: The watch features the famous all natural rubber strap in black. Clasp: The clasp is black PVD stainless steel deployment buckle clasp. Movement: The watch features HUB112 self winding movement. All Classic Fusion watches incorporate the carbon fiber material into their composition. Used in sports cars, bicycles, airplanes and yachts, this revolutionary material weighs half as much as aluminum and is three time stronger. This gives it the highest weight to strength ration of any material. Hublot uses carbon fiber composites in the manufacturing of their case and movement components. In these applications, it is used in a fiber reinforced polymer where compressed sheets of woven fibers are molded into the desired shape and then injected with a binding polymer matrix. In this ways, Hublot is working to use the material in innovative ways and assuring the highest quality watches possible. Ceramic: Both the case and bezel of the watch incorporate the ceramic material. Ceramic is a general term that can refer to any material that is an inorganic, nonmetallic solid prepared by heating and subsequent cooling. It is often used in watchmaking and known for its exceptional hardness and scratch proof characteristics that cause it to never show signs of wear or aging. This makes it a perfect material for a watch’s external components. Hublot uses a specific type of ceramic called zirconium oxide. This is a manmade material available in several colors and tones with black and white being the most common. The watch is available in several different models. The first is the Black Magic. Considered a base model, the watch features an easily readable, fabric black face and the well known all natural rubber strap. This watch retails for $9400. Classic Fusion Chronograph: Introduced in 2011, this watch was a sportier model and made available in an all black model. It featured an all black ceramic case and subdials on the interior of the case. Features of the Chronograph vary from other models in that they offer an 85 hour power reserve and HUB 8011 manufacture manual winding, and minute repeater tourbillon movement. Straps are available in black rubber and alligator. Classic Fusion Chronograph 2012: Released in 2012, these watches were the first to introduce a second color to the all black models. These colors are introduced to a mostly black dial. In the original models the hands and indices were designed in a deep blue color rather than the traditional black. Though pricing for the Chronographs can vary, they are typically priced a bit above the $10,000 mark. Another all black classic Fusion is the Tourbillon Skeleton all black. More of a luxury model, this watch features a clear face designed to show the interior workings of the watch. It is available in an elegant Classic Fusion Classico Ultra Thin as well as a more complicated Classic Fusion Tourbillon Skull. The band is a leather alligator skin. When considering the features of the Tourbillon Skeleton, it differs from other models in a few ways beyond its exceptional design. Most notable is the movement which is HUB6310 manufacture manual winding tourbillon chronograph movement. The power reserve on these watches is also a bumped up 115 hours. This high end watch retails for $132,000. Though people will have various opinions on the Hublot Classic Fusion, they are known to be exceptionally comfortable. The combination of lightweight ceramic and the rubber strap can make you almost forget you are wearing a watch. The buckle allows for easy adjustment and is an attractive addition to the watch. Despite the watch’s all black face, they are surprisingly readable. The hands, beveled and rhodium plated, work to reflect every ray of light allowing for a contrast between the dial and the hands. Its classic black appearance makes it versatile enough to be worn for casual and formal looks. Are Hublot Watches a Good Investment? If you are looking into purchasing a luxury watch, a Hublot might stand out for its unique design and exceptional craftsmanship. But is the watch a good investment? Many argue this point because the brand is so new, it is questionable whether it has truly reached a level where it can be considered classic or iconic. However, as time goes on, more and more experts are conceding that this watch brand is a real contender. However, if there are any doubts in your mind, let’s let the watch speak for itself. 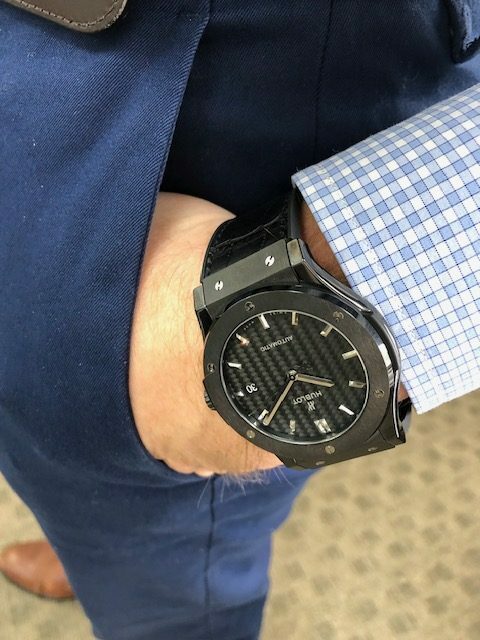 Already a pricey model at retail stores, these can definitely fetch a pretty penny when sold at auctions or to other luxury watch aficionados. Of course, not many of us buy luxury watches for the purpose of selling them. Most find them a status symbol and grow a sentimental attachment to them, making them difficult to part with. But if we find ourselves in a financial bind, the thought of selling them may seem a bit irresistible. Well, it might be useful to know that you can use your Hublot to get you our of a financial bind without selling it. Here’s how it works. Many of use think of pawn shops as places to sell our luxury items. But did you know they offer loans as well? All you have to do is take your watch into a pawn shop. They will appraise it and offer you a loan. The loan amount won’t be for the full value of your watch, but closer to 60% or 70% of its worth. Terms will then be worked out for you to pay off your loan. These terms may vary but, essentially, you can expect to be making regular payments which will cover the base amount of the loan as well as interest rates and fees. Once you have paid off your loan, your watch will be returned to you. If, for any reason, you are unable to pay off your loan, the pawn shop will keep your watch. However, the unpaid amount will never go into collections or show up as an unfavorable mark on your credit report. When looking for a pawn shop to get a loan for your watch, not all locations are created equal. Some will offer better higher values and lower interest rates than others. This will be ideal as you will get the highest loan amounts and be able to make the lowest payments possible. It may take a bit of research to find a pawn shop that will give you the best deal on your luxury item, but, if you’re in the South Florida area, we can help you out a bit. Look no further than Boca Raton Pawn. 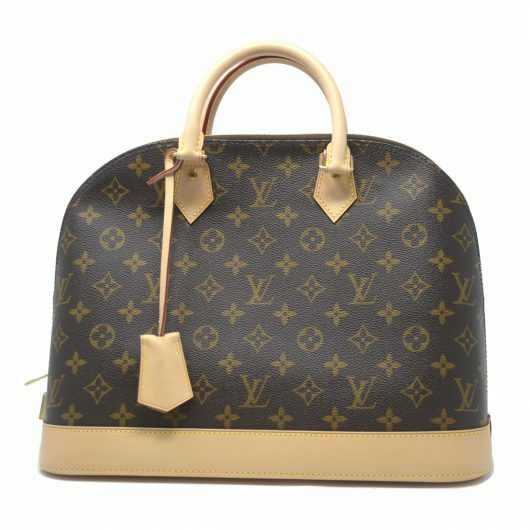 They will always offer you the highest value and the lowest deals on all your luxury items. Great Service: Boca Raton Pawn specializes in luxury items. Their friendly and knowledgeable staff will be on hand to make sure you get the deals you are looking for. They also take the utmost care of the luxury items in their possession. Private Appointments: Boca Raton Pawn understands how important your privacy it, especially when it comes to financial matters. That’s why they offer private appointments to all our customers. Call in advance if you wish to take advantage of this service. Get Cash Fast: When you sell or get a loan with BRP, you don’t have to worry about spending the day in our office. We can appraise your item quickly and, if you agree to the terms we offer, you can walk out of our shop with cash in hand in just minutes. 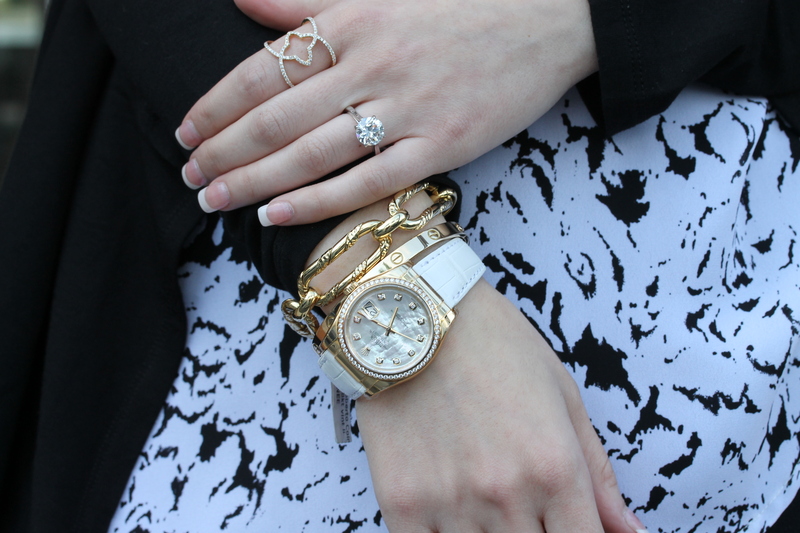 BRP accepts luxury watches, jewelry and handbags. Check our web site in advance to find out what brands we are accepting. 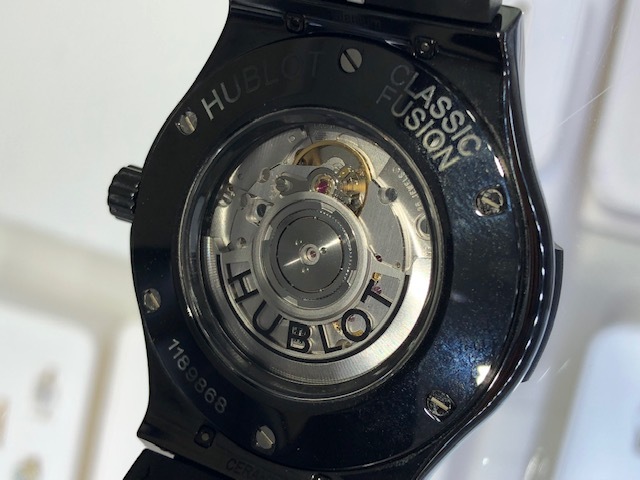 So, whether you have a Hublot Classic Fusion All Black, or any other luxury item we accept, come into Boca Raton Pawn to find out how these items can work to help get you out of your cash crunch. You’ll be glad you did!